I was just reading the combined EPA and NRCS response to a recent article in the New York Times about agricultural runoff polluting Lake Erie. My heart goes out to them—seriously. It is so ironic after they finally licked the problem of industrial and municipal waste pollution in the lake. And even more ironic: one of the causes of the new agricultural pollution is the no-till farming system that is intended to prevent soil erosion. I’m not saying we have all the answers. We don’t. That is why I feel so bad for them. We all are working hard to make food and to protect the environment. You fix one thing and another thing breaks. Plus, nobody is immune to unintended bad consequences. But in our struggle to produce quality food and to protect the environment, we have chosen a very different path. We are not putting chemical fertilizers on the ground at all—not to mention herbicides or pesticides. I look at this picture and thank goodness for that choice. 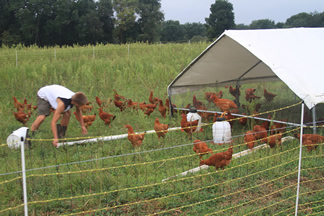 We are currently looking to hire a part-time helper to care for our broiler chickens from April through October. This is a great opportunity for someone who is interested in learning about our sustainable farming practices. All the details are on our Job Openings page. Local artist Kate ODell sent us these images of watercolors she painted of a couple of our cows. Check out these and other paintings by Kate on her web site: http://realsmallart.bigcartel.com/ The original paintings are available for sale, as well as reproductions as note cards. Very nice! I just got off the phone with Steve, who is away on vacation this week. Steve asked me to post this message, because we have heard that some customers were unaware of an ordering deadline originally set for today. If you are thinking about signing up for our Organic vegetable CSA, there is a $40 discount for those who sign up and pay in full early (originally, today). This information was buried pretty deep on our organic vegetable ordering page and in the newsletter we sent out last month, and many people did not see it. So we are extending the discount deadline until Monday, March 4. The discounted prices are $560 for a full share (suitable for a family of 4), and $360 for a half share (suitable for 2 people). Lots more information is on the ordering page, including our Organic vegetable CSA signup form. But if you are pressed for time and you want to get the discount, you can just put a check in the mail by Monday to Steve Normanton, 226 Charles Bancroft Hwy, Litchfield, NH 03052, or send us an online payment via the Intuit Payment Network (https://ipn.intuit.com/pay/SteveNormanton).